Riding Mountain National Park is a 2,969km2 park located approximately 3 1/4 hours (274km) from downtown Winnipeg. We are so lucky to have such a quality national park in our back yard. We highly suggest making this a weekend (or longer!) trip, not because of the drive to get there but because of just HOW MUCH there is to do once you get there! Hiking, biking, beaching, boating, beaver tail eating, paddleboarding, movie watching, star gazing, wishing well-ing, walking, swimming, bird watching, moose sighting, ice cream eating, etc (and trust us, we could go on)! Riding Mountain National Park is a nature lovers paradise and it can also be a lovely place to just kick back and relax. There are so many options for things to do that it makes it a great spot to go to as a group because people can split up and do different activities easily and there are also lots of great group-friendly activity choices. In Wasagaming (the main town site in the park), there are paddleboats, kayaks and paddleboards to rent, and dinner cruises to go on. There is a beautiful beach to build sandcastles and suntan on and beautiful clear water to swim in (there’s a reason it’s called Clear Lake!). There are a multitude of trails to bike, hike and walk on (including a very long and level paved trail along the waterfront). There are lots of great little shops, boutiques, restaurants and ice cream parlors. There are tennis courts and mini golf, and there is even a movie theatre housed in a log cabin (“The largest log cabin theatre in North America!”)! We were even lucky enough to enjoy some live music outdoors at one of the establishments. There are many different accommodation options – cabins, resorts, bed and breakfasts, and of course – the campground! If you don’t have your own camper or tent, there are yurts (OTentiks), and even a Microcube! The Riding Mountain National Park Wasagaming campground is located within easy walking or biking distance to Wasagaming and the main beach. There are other campgrounds in riding Mountain National Park too – Deer Lake Campground, Lake Audy Campground, and Moon Lake Campground. Please note that Whirlpool Lake & campground is closed for the 2018 season. The Wishing Well at the east end of the lake which is an easy bike ride (or walk!) along a beautiful paved path. Here you will find a beautiful garden with paths, a stream, bridges, flowers, carvings, fairy gardens and of course a wishing well. This is an excellent place to relax. Don’t forget your coins and your wish list. The old East gate is located at the east entrance of course on hwy 19. It is a unique structure stretching over the road and as you see it, it will remind you that you are entering a unique area. From here it is a twisting ride up the “mountain” and into the park (or if you drive from Wasagaming to the gate like we did, it will be a twisting ride down to the gate! Be sure to stop at the lookout at the top for a great view!). Just inside the entrance there are some trail heads that range from Burls and Bittersweet which is a short 2km interpretive hike to an over 20km (return) hike to East Deep Lake (maybe we will do this one next time!). The east entrance is a less travelled gravel road. It has numerous trail heads off of it and lots of opportunities to see some wildlife. Moon Lake trail is located off #10 35km from Wasagaming, and close to the North Gate. This 9km trail circles moon lake and has amazing lake views (and delicious raspberries!). Watch for osprey and bald eagles taking advantage of the shore line. Moon Lake is also a location for another campsite area. The campsite and trail there were under Bear Watch warnings while we were there, and we saw plenty of evidence of that as we hiked around it! We also saw lots of moose tracks along the trail. If you enjoy seeking out the Red Chairs, they are located on this trail about half way through the hike. Please be bear aware on this hike or if staying in this camp ground (see tips and hints located at the end of this blog post). The Boreal trail is also just off #10 and only 34km from Wasagaming. This is a short and accessible interpretive trail and boardwalk. Watch for moose enjoying the marshy area. *Hint – you will see paved “pull off” sections along the highway close to this area – scan the landscape and water areas here for Moose – there’s a reason that it’s common for people to pull off the road onto the shoulder here! We were also able to enjoy the Lakeshore trail heading west from Wasagaming. A beautiful 3km single track trail along the shore ending in your own private beach…well until others read this blog and show up too!! To get to the red chairs on this trail we had to wade through a little bit of water. So many more trails to the west that we did not even get a chance to check out…even a bison range. Does anyone have a recommendation for our next trip out there? Our final recommendation for Riding mountain is to head down to the lake at sunset and enjoy watching it from the many public access docks along the south shore and path. Check out our photo of the gorgeous sunset that we were lucky enough to enjoy. At any campsite you stay in, or trail that you hike on, you will need to be bear aware. Here are some tips and hints taken from the wildsafebc.com website that is extremely informative if you are worried about bear encounters and what to do, and how to prevent them. Camping in Front country/designated sitesUse bear resistant bins and/or follow food storage rules as set out at the campsite. Over the Canada’s Parks Day weekend (free entry on July 20, 21 & 22) you don’t need a park pass to visit any of the provincial parks in Manitoba. This weekend will be a great weekend to get out and explore some of the beautiful parks and areas in Manitoba! It looks like the weather forecast (for now anyway – we know how quickly those can change! haha) is fantastic for the weekend and we hope that you all have a safe and fun one! Tubing the Pinawa Channel – revisited with updated information! Looking for some tips and hints on tent camping? Check out these posts on tent camping and campfire cooking. We have been out exploring some new spots too, so stay tuned for some more posts coming soon! Our Play: Let’s Go Camping! post wouldn’t be complete without some tips and hints and menu suggestions for campfire meals. This post is all about simple meals that are easy to cook over a campfire with minimal equipment. We are talking about just packing tinfoil, a small pot or kettle to boil water with, paper plates, cutlery and food. – Omelette in a bag…with a good ziplock freezer bag, crack in an egg or two with your fixings (ham, cheese, mushrooms, cooked bacon, green onions, etc…), squish the bag to blend it all together and then boil the bag until cooked. You can eat it right out of the bag!! – You can make toast over the grill…carefully. – COFFEE TIP: spoon a couple of tbsps of coffee into the middle of a paper coffee filter and tie up with dental floss or string. Use like a tea bag to make coffee. Alternatively, buy the little fillable tea bags (can be found at places like bulk barn, davids tea or amazon). Tip: If you can make supper easy then you have more time to enjoy the experience. – Skewers: make your own skewers with meat and veggies or just veggies! (tip: make sure that grill is hot before putting them on it to cook, or lay tinfoil down on grill and cook skewers on top of tinfoil). – Slice potatoes (+/- onions and/or mushrooms), and cook in packages made out of tinfoil. – s’mores. I was never a fan of s’mores until I was introduced to ones made with celebration cookies. They are a sugar cookie topped with chocolate, so you only need to bring those, a sleeve of graham crackers and a bag of marshmallows. Trail mix, gorp bars, sunflower seeds, carrot sticks…anything you enjoy. – packages of hot chocolate, tea..
– juice boxes or pop or extra water. Freeze as many items as you can – the hot dogs, other meat, the water jugs, the pre-cooked baked potatoes and waffles, some freezies, some individual water bottles… and then refrigerate everything else the night before. Instead of filling your cooler with ice packs we suggest freezing 1 or 2 four liter milk jugs that have been cleaned and filled with water and using these. They take a long time to melt and once they do melt you can enjoy an ice cold glass of water! We also suggest keeping your cooler in the vehicle or shade and cover with a towel. Make a list of everything you need to pack into the cooler, and tape it to the top of the cooler. Check off as you add it in so that nothing gets left behind and you have a “hey, where’s the hot dogs we were going to have for dinner?! Uhh ohhh” moment at the campsite. We also use a separate cooler for drinks. In this cooler you can buy a bag of ice and you don’t have to worry about the cooler getting full of water. This also leaves more room in your main cooler and keeps those items colder because you are not in it as often to get drinks. – Do as much of the prep work at home as possible – cut your veggies up, prep your meat (you can put marinade & meat in a ziploc bag together and freeze). – Use a separate cooler for drinks, and then you can put ice in that one, and you won’t be opening up the food cooler as often which will let more warm air in and warm up your food. Tent camping! For some people it’s the only way to go camping, and it’s a natural, budget friendly and easy way to get out and enjoy nature. For others, it’s something that they have never done, have no idea how to even get started, and may even feel overwhelmed or scared at the thought of trying it. Camping in a tent can be an easy, cost efficient and fantastic way to enhance your experience of exploring Manitoba (and beyond!). Great destinations, beautiful starry nights, campfires (and awesome campfire food!! ), fresh air and lots of great memories – this is what we would love to have everyone experience, and this blog post is all about how to get started. This is also a blog post where we highly encourage questions, tips, hints etc in the comment section below! We wrote a separate blog post for food and recipes and as that deserves a blog just to itself! You can view it here – Eat: Campfire Cooking – Planning and Packing. Tarp(s) – these are pretty cheap, take up minimal space and can make a big difference to your camping experience if it starts to rain or you need some sun protection. You can pick up a basic 12×12 for under $20 and that’s big enough to cover your tent or picnic table. Grab some rope (again, not expensive – this 50′ pkg at Cdn Tire is only $3.59). We also recommend grabbing a pkg of Bungee cord tarp ties as they make it pretty easy to fasten the tarp to trees. If you google search “how to tarp a campsite” you will find lots of different tips, hints and instructions. Cooking & Eating – Let’s start off as basic as possible. Depending on your menu for the weekend, paper plates work great and can be burnt in the fire. Tinfoil and extendable hot dog / marshmallow roasting sticks (find these at dollarama, cdn tire, or on amazon, etc) may be all you need to cook with. Grab some forks and knives and reusable plastic cups from home. An old pot or kettle (hello garage sale or Value Village!) that you can use to heat water up over the campfire is one thing that we could consider a must have, but you may not. Don’t forget paper towels! Work your way up: once you get more in to camping, we suggest picking up some hard plastic re-useable plates/bowls, cups and cutlery just for camping. Pick up a rubbermaid tote that you can devote just to camping and then add to it as you pick up items (hint: garage sales and second hand stores are great places to find lots of items if you are trying to stick within a budget!). If you can borrow a campstove – GREAT, and if you absolutely fall in love with camping then this is a really great investment along with a camp stove griddle (mmm… bacon and pancakes!). Also a cooler is needed for your cold items – this is another item that you can ask friends and family if they have one that you can borrow for the weekend, or watch for sales once you get an idea of what size you will need. Lighting – you can find headlamps and lamps/flashlights etc at the dollar store. Please note that these are cheaply made, but actually work pretty well if you’re gentle on them. Princess Auto is another place where you can find these items at a pretty reasonable price and they have a 3 pk you can buy online for $15. (Make sure that they work and that you have batteries in them BEFORE you head out camping!). If you have a camp site with power consider bringing some patio lights or even some Christmas lights to brighten up your home for the weekend. Sleeping – Most basic, cheap and easy: take your pillows & covers from your bed. If you have a yoga mat, take that to put down underneath you. Working your way up from that: sleeping bag (ask friends/family if they have ones you can borrow, or watch for sales. If you decide you reallly like camping, you may want to make the investment in a decent one but if you’re only going to go out a few times a summer then check walmart or amazon.ca for ones you can find around $30). It does feel more like camping when you are in a sleeping bag though!! The best tip we have is to put something under your sleeping bags (Under will keep you warmer than over). This can be from simple yoga mats to specially designed mats to an air bed. This will be something that is completely a personal preference but we prefer mats (& extra sleeping bag or blanket on top of that but underneath our sleeping bags) over the blow up airbeds. – dry small kindling (small pieces of wood) or some firestarters that you can find at the dollar store, walmart, canadian tire, etc. TIP: save your dryer lint and keep some in a ziploc bag in your campfire kit. It is a quick and easy way to start a fire. All of these usually fit nicely in one of those reuseable grocery shopping bags. Quick and easy campfire building – crumple up newspaper, put in firepit. Put firestarters or dryer lint over top. Add kindling or small pieces of wood (use axe to chop some small slivers off larger pieces of wood) in a teepee-like shape or in criss-cross shape on top (the age old fire starting debate of Teepee vs. Log cabin…which do you prefer?). Add a few slightly larger (think tv or wii remote thickness – except don’t think about them because you are now in the great outdoors!). Light newspaper in several spots. Once wood is all burning, slowly add a few more pieces at at time until you have enough of a base to add the large pieces. Patience is a virtue and dry wood is key when it comes to easy campfire starting. Now sit back and enjoy…The camp fire is the absolute best thing about camping! Am I going to have to pee in the woods?? You do not have to completely rough it while tent camping. Just about all campgrounds have modern facilities that include flush toilets, sinks and even showers. You should be able to select your campsite as close to the modern facilities as you like. The really great thing about tent camping is that it opens up a lot of last minute options for camp site selection, especially if you are ok with basic (which just means no electrical and no water right at your campsite). Basic sites are usually available for 1 night stays too, vs 3 nights that some of the serviced ones require. We’re going to use the provincial booking site for an example. Create an account (easy process) and then this account can be used for all provincial campsite bookings. For the type of facility, select campsite from the dropdown menu. For campground selection, choose the campground you’d like to stay in, ie Birds Hill Park. Check off the types of service you’d like (ie check off basic and electrical) Select your dates and then take a look at the map. Hover your mouse over any green dots to see how many campsites are available for your selected dates and services. Click on one to see a more detailed map of that “bay” with exact locations of campsites. Find one that looks great, is relatively close to a washroom facility and then click on the book now and follow the steps. Grab a few 4L jugs of water (milk jug size). As we mention in our camping food post, these are great for freezing and using as ice packs in your cooler. Think about taking some fold up chairs so that you can sit around the campfire. Mosquito coils (often referred to as doo-doo coils) work pretty well at keeping down the mosquitoes and are quite inexpensive. Always ask at the camp office for insider tips on the trails and activities in the park. Hiking, biking, swimming, walking, birdwatching, eating, visiting, and of course exploring. Check out our “Eat: Campfire Cooking – Planning and Packing” blog post for some meal and menu ideas. Please comment below with any tips, suggestions or questions! We never expected that our Play: Tubing the Pinawa Channel post would get so much notice and attention (especially after being featured in a Narcity post), but one good thing that came out of it was the economic spinoff for some local businesses, and the boost to local tourism! This has led to some really great options for anyone planning a trip out to Pinawa to try tubing this summer who don’t want to worry about how to get picked up at the end of the channel, or what kind of tube to buy, etc. It also expands the options from just tubing to the suspension bridge to kayaking and canoeing from the start of the channel, all the way to the Old Pinawa Dam (yes, we have done that, and then we’ve gone body surfing once we got there which was super fun too!). They are now offering a few different “Pinawa Float” packages. Prices are based per person with an 8 person minimum and 14 person maximum. Please call Miranda at 204-345-6294 to book. Wilderness Edge have expanded their trip package options, now have 300% more tubes than last year and more than double the staffing. The big changes are that you now can reserve your tube online up to 30 days in advance, and all payments are done online to avoid the long payment lines of last year. They have now also included canoe rentals and body surfing packages, which were only available to their hotel guests previously. They also offer canoe pickup at the old Pinawa Dam for those that choose that route. If canoeing to the dam is on your bucket list this summer, consider doing a guided tour if you aren’t experienced at canoeing. There are some rapids that you will have to navigate through depending on the water levels. This is a beautiful canoe trip, and also a long one (4-ish hours) with 1-2 areas that you may choose to portage vs canoe through. – Canada day long weekend in Lac du Bonnet for lots of fun and incredible fireworks! – July 20-22 is the Pinawa Birthday Celebration weekend! – August long weekend is the Fire and Water festival in Lac du Bonnet. Don’t forget to check out the beautiful Pinawa golf course while you’re in Pinawa if you like golfing or are just looking for somewhere to grab some food. As with all of our posts, we do ask that you DON’T litter – please take your trash with you if the garbages are overflowing there (extra awesome brownie points if you pick up some extra garbage on your way out too as this was sadly a HUGE problem last year) Pack out what you pack in, and leave no trace. Thanks for visiting our blog! We stumbled across this fantastic pottery workshop place while looking for things to do en route to a trip across the border. Tucked away in the countryside in Woodmore Manitoba (approximately 1 hr south of Winnipeg just off #59 hwy), Bridgehill Pottery offers very affordable pottery classes, suitable for any level of learning. Workshop sessions are scheduled by mutual agreement with the owner Joanne. For our first visit, we wanted to try out the wheel and play around and have some fun. Our visit exceeded our expectations. Joanne is an amazing (and very patient and encouraging!) teacher and we ended up making mugs (AND a bowl, a tray, and even a few Christmas ornaments!) that we could actually end up taking home after they were glazed and fired! The whole experience was fantastic and after we left we couldn’t stop talking to each other about how much fun we had. A few weeks later I went back to glaze our pieces and then a few weeks after that, they had been fired and ready for pickup! Joanne had offered to glaze our pieces so that we didn’t have to make the trip back, so that may be an option if you are traveling a long distance to get there. If you’re able to tie the trip in with another activity (ie tubing or kayaking the Roseau River or hopping across the border to fill up on gas 😐), I do recommend doing the glazing yourself as it’s a neat experience and a way to personalize your piece even more. From highway 59 head west on 201 to Rd 24E. Turn right (north) for two miles and follow the road over the bridge to the top of the hill. From the west travel east on the 201 to Rd 24E. Turn north (left) and travel for 2 miles. Follow the road over the bridge to the top of the hill. From St. Malo ~ head south on the 218 to Rd 11N. Turn east for three miles. Tucked away in the little community of Whitemouth, the Spicy Radish Cafe is a cute little eatery with really great food. I stumbled upon this restaurant years ago when they were still located in Elma, and was happy to see it remain in the same general area when it relocated. It is a great location to stop at when out exploring the Whiteshell area. There are several ways to get to the Spicy Radish from Winnipeg and they will take approximately 1 hr and 20 mins from downtown Winnipeg. Heading North on 59 and then East on 44 will take you past Birds Hill Park and through Beausejour. Heading straight East on hwy 15 is another route, and a great way to go if it’s strawberry picking season because there are some nice places to pick Strawberries at in the Elma area! Either route you decide to take, keep an eye out for wildlife – it is common to see deer, bears and other wildlife in these areas. The Spicy Radish offers a great selection of fresh, homemade meals made with locally grown and produced food. (Even their coffee is made locally in Elma by Trails End Coffee). You can call ahead and order takeout if you’re in a hurry or want to grab some food to take on a picnic. Their burgers are great (double bacon spicy radish burger, oh my gosh – SO good! ), but I personally am a diehard fan of their chicken ciabatta sandwich served with either their beet or spinach salad. They often have dinner specials which can be found on their website or facebook page, and please note that they are closed on Tuesdays. “Birtle, you sure are beautiful” was what we thought as we got our first glimpse. It is amazing how quickly the landscape changes in that area of Manitoba. This beautiful area appears surprisingly out of our flat prairie to expose a treed valley, ravines and the Birdtail River. While we have made most of our trips during non-winter weather when it’s easier to get out and explore and see what each area has to offer, we know that there are many options for exploring the 204 even during our winter months. We really wanted a winter adventure weekend some place where we could rent a cabin and get out and snowshoe, go cross country skiing and have a relaxing weekend. “Birtle’s Riverside Cabin” came up on a search and it seemed like the perfect place, in the perfect location to enjoy and share on here! Birtle is located approximately 3 1/2 hrs from downtown Winnipeg. Taking Hwy 16 there will be shorter by about 40km, and it will be a little more scenic, with a lower speed limit, several small towns en route (lower speed limits) and the possibility of being stuck behind slower moving vehicles while waiting for the next passing lane area. Taking Hwy 1 out to just West of Virden and then hwy 83 North to Birtle will increase the trip distance to about 350km from downtown Winnipeg, but will actually get you there faster so that you have more time to enjoy this charming, friendly little community. Birtle is a mix of old buildings and newer homes with a respect for heritage that can be seen in the murals and decorative public art. The definite jewel of this community is Birtle Riverside Park. Even covered in snow the many recreational activities are evident including a golf course, campground, tennis courts, a fantastic looking playground and Birtle Beach which is a sand bottom and chlorinated water. We may have to put this location on our list for a summer visit but for this trip it was all about enjoying some winter fun! The park has numerous well marked trails that we were able to enjoy for a day of snowshoeing. The trails surround a rustic warm up cabin stocked with a wood stove, dry wood, and some cooking utensils. We replenished our energy and continued our trek, enjoying the amazing views. The next day we tried out the freshly groomed cross country ski trails and enjoyed conversing with (very friendly!) locals at this hidden gem. They were very proud of this area, and rightly so – it’s gorgeous! All of these winter activity opportunities were right outside the door of the cabin that we rented, where we also enjoyed watching the deer walk through the yard. We couldn’t help but talk about how great these trails would be for hiking and biking at in the summer! There is also a strong community for sledders in this area, with snowmobile trails with links to Snowtraxx and Snowman routes. One very unique offering in this community is the Whooo’s That costume barn. With over 3000 handmade costumes this place is amazing (the pictures on their website do not do it justice!). Elly is the owner/artist/designer/sewer/host who graciously provided a tour and shared some of her favorite costumes and memories from her many years in the business. Have your picture taken in period dress or just a silly costume, rent something special for your next event, or just get your pirate on!! This place is definitely worth a visit! We had so much fun during our short stay, and would love to visit here again in the summer for some kayaking, hiking and swimming! The Forks in Winnipeg is a fantastic place to spend a day at, especially at this time of year when the weather is starting to warm up after a long cold winter. There are so many different activities and things to do in that area! We’re “lucky” that our winter was long and cold this year because the river trail is still open (it was closed by February long weekend last year), the warming huts are still out, Ice Castles are still standing and the Festival du Voyageur is waiting to be explored, so grab your skates and your red sash and let’s go! One of my favourite things to do each year is check out the warming huts on the river trail. I love seeing what new ones there are each year! This year the winners reigned from such places as Mexico, Estonia, Vancouver BC, Chicago, England and right here in Winnipeg! We lounged in Bubble Beach, and climbed up inside a Golden Bison. We crossed the Open Border and sat in an ice lantern and we spent several hours exploring, taking pics and testing them all out while marveling at the creativity involved in designing them. Festival du Voyageur runs until Feb 25 and we swung by there for some music, entertainment, ice sculpture viewing and of course, maple snow candy eating (we left our car parked at the Forks and walked over because we didn’t realize that there was a shuttle, oops! It’s a beautiful walk though!). We had to try out a couple of different kinds of poutine (Tourtiere poutine! Perogy poutine!) and some sweet sweet sugar pie, oh my. Our final stop of the day was back at the Forks to explore some castles made of ice. We pre-purchased tickets online and chose an 8pm time slot which was actually perfect (if you don’t plan on staying at Festival late into the evening). The ice “castles” were beautifully lit up, and there was even a fire show to watch (check their website for showtimes). We hope that you have a chance to explore all three of these this weekend! Virden Manitoba, located about 3 hours west of Winnipeg on the Trans Canada hwy #1 is an easy destination to get to if you’re looking for a weekend break from the city. 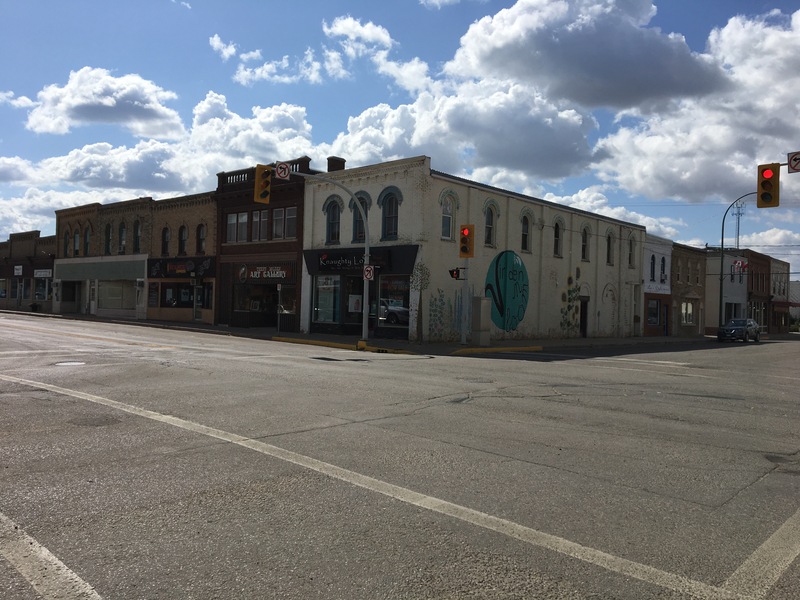 One of the first things that we noticed when exploring downtown Virden was the really cool architecture and beautiful old buildings. There’s also an old train station that was built in 1900, restored in 1994 and is now home to several community organizations. Next to the train station is an underground pedestrian tunnel. There are several parks in Virden as well – including Victoria Park and Centennial Park. Virden has some amazing photo opportunities! A beautiful little area called Eternal Springs is located about 24 km outside of Virden and contains a 66ft swinging bridge, two small stocked trout ponds, hiking trails, BBQ pits, picnic areas, a wooden staircase up to the top of the hill and more. It was truly one of the best little hidden gems we have found so far, and hidden it is – you will need to write down the directions or use google maps to find it (my iphone map app couldn’t locate it). Some fun photo opportunities in this location too! 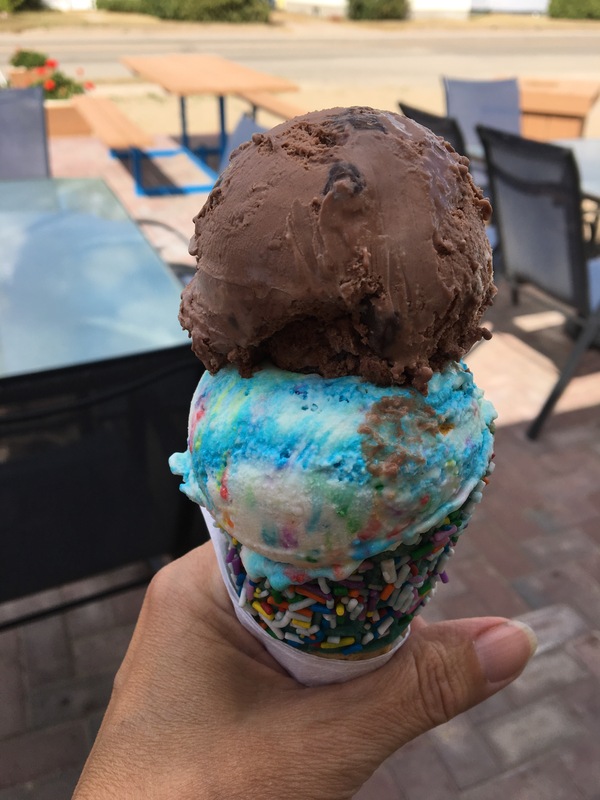 If you’re in the mood for ice cream while you’re in Virden, you are IN LUCK because Virden has an awesome ice cream place called Ice Cream Island which has an extensive list of choices of delicious cold treats. Ice Cream Island also has burgers, hot dogs and a variety of deep fried treats (including deep fried broccoli! Owners of this place – if you’re reading this can you please tell us how that random item made it into your menu? I mean.. how does broccoli even end up in an establishment that serves ice cream and burgers?? Inquiring minds need to know) Please note that they close for the season on October 1st. We’re not sure if that is weather related or if that’s when broccoli season ends, but if you want to check them out make sure you do so before then. For only the second time on our blog, we are going to mention the “S” word but we only do so when crossing across the border into Saskatchewan is totally and completely worth it and this one is. Located in Maryfield Saskatchewan is the Arlington Hotel, and located in the Arlington Hotel is a steak pit. It was actually Canada’s very first steak pit according to their website. This is where you get to cook your own steak on an indoor pit. The steaks are cut and vacuum sealed every day and you get to choose your own steak from a variety of choices and sizes. With your steak you also get a baked potato (seriously perfectly cooked), salad, and a piece of garlic bread that you can toast yourself on the pit. If you’d prefer, chicken is an alternative choice, along with shrimp and/or shish kebabs. The little town of Maryfield is SUPER cute too.